Using arrays of long, thin silicon wires embedded in a polymer substrate, a team of scientists from the California Institute of Technology (Caltech) has created a new type of flexible solar cell that enhances the absorption of sunlight and efficiently converts its photons into electrons. The solar cell does all this using only a fraction of the expensive semiconductor materials required by conventional solar cells. "These solar cells have, for the first time, surpassed the conventional light-trapping limit for absorbing materials," says Harry Atwater, Howard Hughes Professor, professor of applied physics and materials science, and director of Caltech's Resnick Institute, which focuses on sustainability research. The light-trapping limit of a material refers to how much sunlight it is able to absorb. The silicon-wire arrays absorb up to 96 percent of incident sunlight at a single wavelength and 85 percent of total collectible sunlight. "We've surpassed previous optical microstructures developed to trap light," he says. Atwater and his colleagues—including Nathan Lewis, the George L. Argyros Professor and professor of chemistry at Caltech, and graduate student Michael Kelzenberg—assessed the performance of these arrays in a paper appearing in the February 14 advance online edition of the journal Nature Materials. Atwater notes that the solar cells' enhanced absorption is "useful absorption." "Many materials can absorb light quite well but not generate electricity—like, for instance, black paint," he explains. "What's most important in a solar cell is whether that absorption leads to the creation of charge carriers." The silicon wire arrays created by Atwater and his colleagues are able to convert between 90 and 100 percent of the photons they absorb into electrons—in technical terms, the wires have a near-perfect internal quantum efficiency. "High absorption plus good conversion makes for a high-quality solar cell," says Atwater. "It's an important advance." The key to the success of these solar cells is their silicon wires, each of which, says Atwater, "is independently a high-efficiency, high-quality solar cell." When brought together in an array, however, they're even more effective, because they interact to increase the cell's ability to absorb light. "Light comes into each wire, and a portion is absorbed and another portion scatters. The collective scattering interactions between the wires make the array very absorbing," he says. This effect occurs despite the sparseness of the wires in the array—they cover only between 2 and 10 percent of the cell's surface area. "When we first considered silicon wire-array solar cells, we assumed that sunlight would be wasted on the space between wires," explains Kelzenberg. "So our initial plan was to grow the wires as close together as possible. But when we started quantifying their absorption, we realized that more light could be absorbed than predicted by the wire-packing fraction alone. By developing light-trapping techniques for relatively sparse wire arrays, not only did we achieve suitable absorption, we also demonstrated effective optical concentration—an exciting prospect for further enhancing the efficiency of silicon-wire-array solar cells." 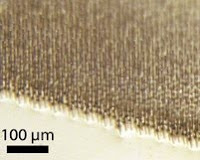 In other words, while these arrays have the thickness of a conventional crystalline solar cell, their volume is equivalent to that of a two-micron-thick film. Since the silicon material is an expensive component of a conventional solar cell, a cell that requires just one-fiftieth of the amount of this semiconductor will be much cheaper to produce. The composite nature of these solar cells, Atwater adds, means that they are also flexible. "Having these be complete flexible sheets of material ends up being important," he says, "because flexible thin films can be manufactured in a roll-to-roll process, an inherently lower-cost process than one that involves brittle wafers, like those used to make conventional solar cells." Atwater, Lewis, and their colleagues had earlier demonstrated that it was possible to create these innovative solar cells. "They were visually striking," says Atwater. "But it wasn't until now that we could show that they are both highly efficient at carrier collection and highly absorbing." The next steps, Atwater says, are to increase the operating voltage and the overall size of the solar cell. "The structures we've made are square centimeters in size," he explains. "We're now scaling up to make cells that will be hundreds of square centimeters—the size of a normal cell." Atwater says that the team is already "on its way" to showing that large-area cells work just as well as these smaller versions.